When you first see the Log House, you'll probably think it's a log cabin, but it's not. The primary difference between a log cabin and a log house is in the details, specifically the construction details. For example, the drip line on the bottom of the logs allow the house to shed water, protecting the wood from the deteriorating effects of water on logs. 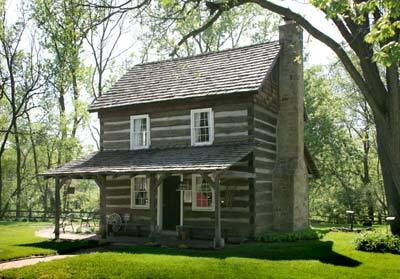 The Log House was built by David Shull for his bride Julia in 1840. Originally located off Cherrybottom Road, the Log House has survived and achieved a place of importance in Gahanna's Historic area. The Log House was discovered underneath a clapboard siding hiding its true history. Sensing the historical significance of this find, the builders donated the building to the new Gahanna Historical Society. The only catch: the house had to be moved to make way for a new housing project. The new Historical Society made arrangements to fund the moving project. The city owned some vacant land along the Big Walnut on South High Street, so that was the logical choice. After the move, the Gahanna Historical Society had the major task of restoring the house to as near as possible its original condition. After completing the restoration, the interior of the house looks much the way it might have looked in 1840s. The furnishings are typical for that time period. 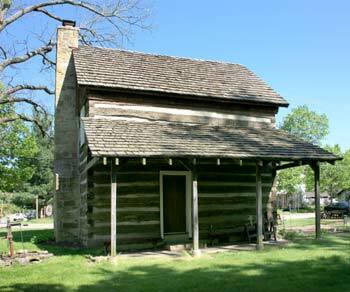 In the 1990s the final phase of the restoration was completed by adding the front and back porches to the Log House. Outside there is a traditional New England style herb garden as well as other period artifacts. The Log House is open for visitors during special events such as the Holiday Lights Festival, Creekside Festival and the May Herb Festival. The Log House is also a regular stop by local elementary school classes. Meetings are held the second Wednesday of each month at 7:00 p.m. in the lower level of the John Clark House (next door to the Log House). Quilters meet most Tuesdays at 7:00 in the lower level of the John Clark House. Annual May Festival is held the third Saturday of May on the grounds of the Historical Society at 102 South High Street. The annual Gahanna Historical Society's Flea Market is held the third Sunday in September on Mill Street and other Olde Gahanna streets.